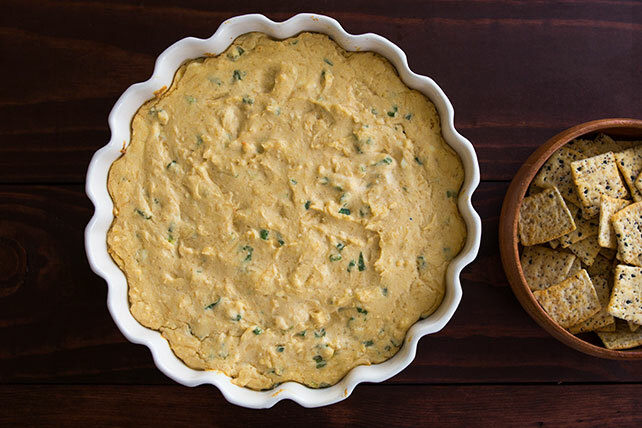 Cream cheese, canned crabmeat, Parmesan, green onions, wine, horseradish and hot pepper sauce are blended and baked into a savory hot appetizer dip. Preheat oven to 350°F. Mix all ingredients with electric mixer on medium speed until well blended. Spoon into 9-inch pie plate or quiche dish. Bake 25 to 30 min. or until lightly browned. Serve with assorted crackers. Even canned crabmeat can contain tiny pieces of shell, so use your just washed fingers to pick over the crabmeat before adding to a recipe. Prepare as directed, using PHILADELPHIA Neufchatel Cheese. Sprinkle with 1/4 cup toasted PLANTERS Slivered Almonds before baking.